Packing a lot of content to roll up. atamari Forever is the latest entry into the psychedelic rolling action/puzzle series and the first title to hit PS3. Those familiar with the series will have no problem picking it up. Forever controls exactly the same, with the addition of the "Prince Hop" move trigged either by flinging the sixaxis controller upward or by a shoulder button. The Prince's hop move is actually part of the basis of the storyline. When the game begins, the Prince is practicing his hop, but the King of All Cosmos (being the showoff that he is) shows the Prince how it's done. He leaps into the stars only to get beaned on the noggin by a rogue object in space. He enters a coma and suffers from amnesia, so the Prince and his cousins come up with a plan to build a RoboKing to perform the king's duties while he is asleep. Their plan backfires when RoboKing goes berserk and destroys all the planets and stars. Now it's up to the Prince (and any cousins he rolls up along the way) to roll up katamaris and rebuild the cosmos. The King's Cosmos takes place in the past, importing levels from previous games.You begin Katamari Forever with access to "Forever" mode, which is just like the traditional game mode. The game's 34 levels are split into two sections: The King's Cosmos and RoboKing's Cosmos. RoboKing's Cosmos takes place in the present and are new levels to the game. They're in full color, bright and shiny like a rRoyal rainbow, and look quite beautiful in full HD. Most of the objects are still blocky and cartoon-like, but the style is intentional, and the animation and textures are still smooth. 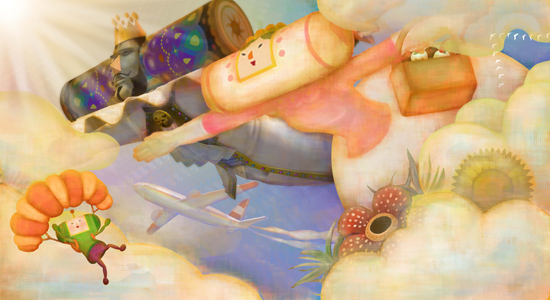 The King's Cosmos takes place in the past, importing levels from previous Katamari games. The levels start in black and white, but color starts to return when you start rolling up objects, and fully returns when you finish the level. The graphics in these levels are updated to match the new levels. When you revisit levels you've completed you have the option to filter the graphics with cel-shading, pencil lines, and more. Advancing through levels, you'll come across another new addition: the king's heart. When you collect one, you'll either pull in all objects within a short distance of yourself, or you'll act like a magnet attracting all objects your katamari is large enough to collect for a short time. A lot of fan service for those who already love the series.After finishing "Forever" mode, you unlock "Drive" mode, which plays essentially the same but in which you move much faster. Some levels also unlock "Eternal" mode after completing them on "Drive," giving players the opportunity to roll to their heart's content. In addition to the main story modes, Forever also has a few mini-games and a multiplayer mode. Unfortunately, multiplayer is local-only, but one can hope they'll add online via DLC. One mini-game is used as punishment for failing the requirements of a level in which you have to dodge falling rocks that bounce and split apart. A jumping mini-game is unlocked after finishing "Forever" mode, and a Beautiful Katamari mini-game is unlocked after finishing "Drive" mode. These three games can be accessed any time after being unlocked in the menu area. Katamari Forever's music is primarily remixes of older games' tracks, featuring a variety of artists including chiptune legend YMCK. It also has a handful of new tracks and, as usual, it's an eccentric mix of music that fits perfectly with the game to make it all the more enjoyable. Katamari Forever definitely features a lot of fan service for those who already love the series. If you didn't like the past installments, this isn't anything particularly new. New players have the potential of falling in love with the series from this title, but the King's Cosmos levels might be a turn-off. Fans, however, will definitely love the title, and for a low retail price it packs quite a lot of content to roll up. The art design for the game — especially collateral works like concept paintings and backgrounds — is really masterful.